On Wednesdays Budokan Judo Club hosts our special MONSters judo program. Over the years, this class has grown enormously, and is very popular with parents and kids alike ... as well as the coaches of course! 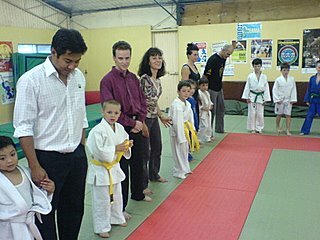 The classes are run by coaches Dale Keogh (6th dan) and Andras Koltai (1st Dan), with regular assistance from other senior players in the club. 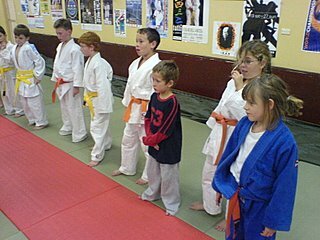 In these classes, the focus is on developing motor skills, learning to fall safely (breakfalls), learning basic judo techniques such as thows and hold-downs and preparing the kids to enter the Junior under 16s judo classes on Tuesdays and Thursdays. The children who participate in this class are required to be attending school. This means that they would be 5 years old or about to turn 5. This is important from the perspective of developing social skills and having a better ability to develop an understanding of authority and discipline. 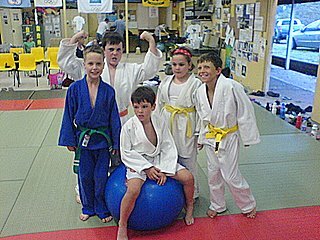 Most of all, however - the focus is on fun, because judo is a fun activity!! 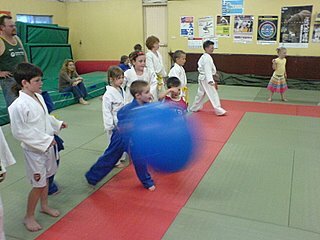 There are many judo-related games that the under 9s play - such as red-green and the breakfall games using the crashmats! Classes are run on Wednesdays in line with the school terms, so there are 4 terms. We generally don't like to take on beginners too much after the school term commences so that new members can start together in groups. Check with the coaches. Due to the popularity of these classes, new enrolments are usually only accepted in the first 3 weeks of the beginning of each term. This allows us to structure our classes so that all new beginners learn the important breaksfalls and basic judo skills together. Class fees are due at this time. The last training session of each term is a great favourite with the kids, parents and of course - the instructors! Our Parent's Night session has all parents joining their kids on the mat for a training session. The kids love to teach their parent's the throws, games and hold-downs and it gives the parent's a chance to share in the fun of our judo lessons! To contact Budokan Judo Club about the under 9s class, please visit the club at our location or send us an email on our contact page. You are always free to come and watch a session on any training night and have a chat with some parents or the instructors.